As seen from above, from another one of many secret spots in this tiny place – Three Arch Rocks look less imposing and even rather small. The rocks are a National Wildlife Refuge, as established early in the century by two conservationists, William L. Finley and Herman Bohlman, who started photographing the area back in 1901. Hunters used to go to the rocks for target practice, killing sea lions and birds with startling regularity. Seabird eggs were also stolen in intense numbers. 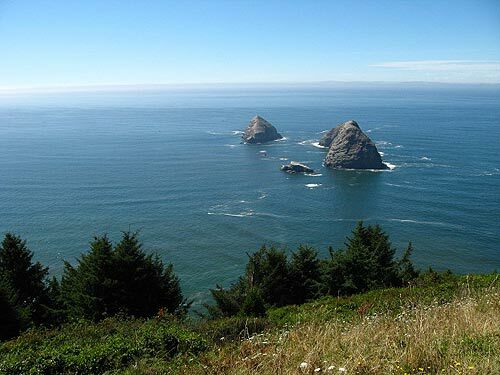 The pair brought their observations to President Theodore Roosevelt in 1903, and in 1907 Roosevelt declared the sea stacks a national wildlife refuge. Now, over 250,000 seabirds nest there throughout the year, and boats are not allowed within 500 feet of it from May through September. 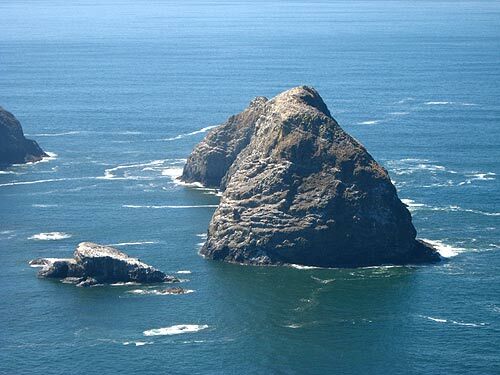 The middle rock actually has an impressive hole in the middle, but this can only be seen by going a few miles north to the cliffs of Cape Meares.